The Biggest Lie in the Computer Industry? What’s the biggest lie in the Computer Industry? It’s the myth that Apple’s don’t get viruses. Geek For Hire has been out there fixing computers since 2001 and we’ve seen just about everything. When someone tells me they have a Mac, or are switching from a PC to a Mac because Mac’s don’t get viruses, I have to respectfully disagree. In the last few months, we’ve been seeing more and more viruses on Mac machines. Everything from lots of adware and pop-ups, to “a lady’s voice keeps telling me to run my virus scanner”, to what’s commonly being called “scare-ware”. Malware is the general term used for any malevolent or bad software that can get loaded onto your computer. Spyware is software installed on your tech device without your knowledge or consent. It collects information about you and relays it to an external person or organization. Adware is frequently called pop-ups. This is where you get lots and lots of pop-ups with advertisements. Lots of people just live with this type of infection not realizing that it’s often accompanied by other more malicious malware. Virus is the most common term used by “real” people for all of these types of infections. Scareware is similar to Adware in that it generates a pop-up. In this case though, the pop-up tells you that your machine has an infection and you need to visit a particular website RIGHT NOW to get the virus removed. How to keep your computer safe? Be careful what you click on! Don’t open attachments in emails. Don’t click on ads on the websites you visit. Above all, make sure you select an anti-virus program that continually upgrades their software and pushes those changes to your computer. We recommend ESET’s NOD32 anti-virus protection for Mac’s and PC’s. Did you think Apple machines were impervious to viruses and other malware? What steps do you take to keep your machine safe? Let us know in the comments below! We’re not sure if we should file this under “scary” or “”weird coincidence”. On Saturday Chris noticed that we were out of aluminum foil. We had a long conversation about it, revolving around his mom. When she moved out to Colorado to live with us in 2001 she moved almost her whole house with the exception of some furniture. And she LOVED the deals at Costco! So, yes, her closets were full of supersized cases of paper dinner napkins, paper plates, plastic cups, laundry detergent, plastic wrap, AND aluminum foil. She insisted that she would still be needing all that, so we moved everything across the country from Long Island. I’ve slowly given much of the party goods away, although we still have a ton of plastic forks, but we always seemed to have a never ending supply of aluminum foil and plastic wrap. When I went to get another roll from the garage, I noticed we were all out! We joked about not having any more foil from the Pathmark in Massapequa. An hour later I was looking for something on Amazon and an ad for Reynolds Wrap was prominently displayed. Huh?! 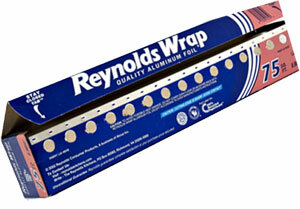 When was the last time you saw an add for Reynolds Wrap on your screen? A year or so ago, I might have said it was just a strange coincidence. Today, I’m not so sure. With all of the SmartPhones in the room at the time, one of them was bound to be listening. Hey Siri is only available on the iPhone. “OK Google” is available within the Google app on your SmartPhone. There are subtle differences in the instructions depending on whether you have an Android, iPhone, or Windows, but these are essentially the same steps each time. What are your thoughts about surveillance? How do you protect your privacy? Let me know your favorites in the comments below! When we decided to get rid of DirecTV, we were paying over $100 every month. Lots of times we would flip through hundreds of channels and find nothing interesting to watch. We talked about it for months and eventually, of course, we cancelled DirecTV right before the Rockies were in the World Series, but who would have thought they’d get that far?! Since then, we’ve found that there are a number of different websites and applications that allow you to watch movies, news shows, and weekly or nightly TV shows without having to subscribe to a cable or satellite service. All of these services come with a free trial. Netflix – Starts at $7.99 for one viewer/ $9.99 for 2 / $11.99 for 4 viewers – Netflix is what we primarily use at our house and we’re pretty happy with it. Downsides? There are times when it “thinks” and we watch the little red circle spin round and round for minutes on end. They also don’t seem to like when you watch two many movies back-to-back-to-back. Amazon Prime – $99 per year – Not just movies, Amazon Prime includes free two day shipping, streamed music, Kindle books, etc. Hulu – $7.99/month, $11.99/month without commercials – You can watch current episodes and entire seasons of TV shows. The fine print says that some of the more popular shows still have commercials, but they are limited to the beginning and end of the show as opposed to interrupting the show two or three times with commercials. YouTube has always been free, but there is the time hassle of finding what you want. Increasingly, there are commercials either before or during the video. Commercial shows are generally not available on YouTube. HBO Now – $14.99/month – You no longer need to subscribe to a cable or satellite service to get Home Box Office! Acorn TV – $4.99/month with first month free – For folks who like British shows. A friend of mine has been streaming Acorn for quite a while now. She and her husband really like it. CNN – you can watch various videos. Live CNN news is only available to cable or satellite subscribers. MSNBC – has a number of regular programs that you can watch the day after they have been aired. Like CNN, you can only watch MSNBC Live as a subscriber to cable/satellite. Roku – works with your existing TV to stream whatever apps you’ve signed up for. In this case the cost is for the hardware – $50 – $130 plus the cost of streaming apps. Roku works with Netflix, Amazon Prime, Hulu, PBS, Acorn TV, and many others. Apple TV – Works like a Roku or Amazon Fire TV, where it needs an internet network connection to retrieve content, and has an HDMI jack which contains video and audio which outputs to an HDMI-input port on your television. It has a small and narrow shaver-like remote control, and can display video from apps such as Netflix and Hulu. The differentiator of the Apple TV is that it can be used to remotely display the content of your Apple computer. But the computer must be within about 10-15 feet of your high end WiFi router, or else the video artifacts will make the display look very blocky. Which of these services do you use? Are there others that you use that I didn’t include? Let me know your favorites in the comments below!